Miniature O-type backward-wave oscillator tube produced by Varian in 1956. It could be voltage-tuned over an 8.2 - 12.4 GHz range and required a supply voltage of 600V. A backward wave oscillator (BWO), also called carcinotron (a trade name for tubes manufactured by CSF, now Thales) or backward wave tube, is a vacuum tube that is used to generate microwaves up to the terahertz range. It belongs to the traveling-wave tube family. It is an oscillator with a wide electronic tuning range. An electron gun generates an electron beam that is interacting with a slow-wave structure. It sustains the oscillations by propagating a traveling wave backwards against the beam. The generated electromagnetic wave power has its group velocity directed oppositely to the direction of motion of the electrons. The output power is coupled out near the electron gun. It has two main subtypes, the M-type (M-BWO), the most powerful, and the O-type (O-BWO). The output power of the O-type is typically in the range of 1 mW at 1000 GHz to 50 mW at 200 GHz. Carcinotrons are used as powerful and stable microwave sources. Due to the good quality wavefront they produce (see below), they find use as illuminators in terahertz imaging. The backward wave oscillators were demonstrated in 1951, M-type by Bernard Epsztein  and O-type by Rudolf Kompfner. 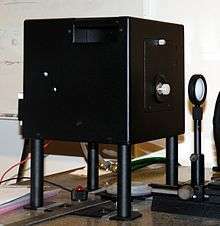 The M-type BWO is a voltage-controlled non-resonant extrapolation of magnetron interaction, both types are tunable over a wide range of frequencies by varying the accelerating voltage. They can be swept through the band fast enough to be appearing to radiate over all the band at once, which makes them suitable for effective radar jamming, quickly tuning into the radar frequency. Carcinotrons allowed airborne radar jammers to be highly effective. However, frequency-agile radars can hop frequencies fast enough to force the jammer to use barrage jamming, diluting its output power over a wide band and significantly impairing its efficiency. Carcinotrons are used in research, civilian and military applications. For example, the Czechoslovak air defense detection systems Kopac passive sensor and Ramona passive sensor employed carcinotrons in their receiver systems. z being the direction of propagation, p the pitch of the circuit and n an integer. A periodic structure can support both forward and backward space harmonics, which are not modes of the field, and cannot exist independently, even if a beam can be coupled to only one of them. As the magnitude of the space harmonics decreases rapidly when the value of n is large, the interaction can be significant only with the fundamental or the first space harmonic. The M-type carcinotron, or M-type backward wave oscillator, uses crossed static electric field E and magnetic field B, similar to the magnetron, for focussing an electron sheet beam drifting perpendicularly to E and B, along a slow-wave circuit, with a velocity E/B. Strong interaction occurs when the phase velocity of one space harmonic of the wave is equal to the electron velocity. Both Ez and Ey components of the RF field are involved in the interaction (Ey parallel to the static E field). Electrons which are in a decelerating Ez electric field of the slow-wave, lose the potential energy they have in the static electric field E and reach the circuit. 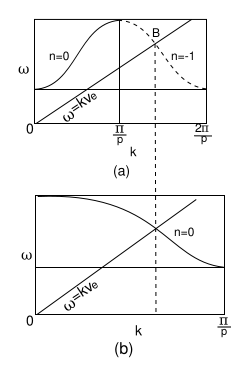 The sole electrode is more negative than the cathode, in order to avoid collecting those electrons having gained energy while interacting with the slow-wave space harmonic. The O-type carcinotron, or O-type backward wave oscillator, uses an electron beam longitudinally focused by a magnetic field, and a slow-wave circuit interacting with the beam. A collector collects the beam at the end of the tube. The BWO is a voltage tunable oscillator, whose voltage tuning rate is directly related to the propagation characteristics of the circuit. The oscillation starts at a frequency where the wave propagating on the circuit is synchronous with the slow space charge wave of the beam. Inherently the BWO is more sensitive than other oscillators to external fluctuations. Nevertheless, its ability to be phase- or frequency-locked has been demonstrated, leading to successful operation as a heterodyne local oscillator. This sensitivity as compared to the cathode voltage sensitivity, is reduced by the ratio ωq/ω, where ωq is the angular plasma frequency; this ratio is of the order of a few times 10−2. Measurements on submillimeter-wave BWO's (de Graauw et al., 1978) have shown that a signal-to-noise ratio of 120 dB per MHz could be expected in this wavelength range. In heterodyne detection using a BWO as a local oscillator, this figure corresponds to a noise temperature added by the oscillator of only 1000–3000 K.
Johnson, H. R. (1955). Backward-wave oscillators. Proceedings of the IRE, 43(6), 684-697.